This living room is a classic example of the avante garde innovations in interior design, which delves into cutting-edge design and appeal, for a futuristic look. 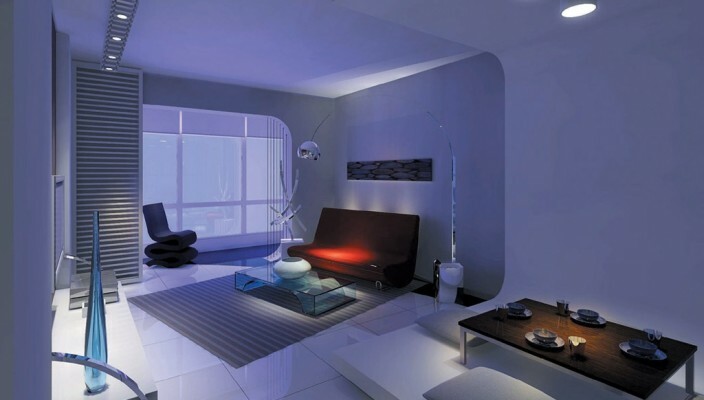 The pale blue walls of the room, lend to it an ethereal, yet eerie feeling, as if one set in a science fiction novel. The sectioned and focussed lighting from various parts of the wall and décor highlights certain sections of the room, while strategically keeping others in dark. The living room opens into a dining area, where the dinner table and the low lying couches are set upon an elevated platform that is built into the wall, enhancing the new age look. Odd knick-knacks, like the long sculptures are a work of abstract art, installed across the room. The bight auburn furniture, set against the glass panelled windows set the mood for a perfect cup of coffee on a rainy day, while the sensational lighting turns this room into nothing short of mesmerising!